Viscious Global Warming attacks Australia with snow! But summer still has more than three weeks to run. Carbon dioxide is indeed a wiley greenhouse scourge, which can whimsically freeze both hemispheres at once! Or maybe it is dumb scientists, and Al Gore, who have made carbon dioxide appear intelligent. THE final day of summer in the Snowy Mountains has taken on a wintry chill after snow fell last night at the ski resorts of Perisher Blue and Thredbo. A light dusting of snow blanketed the NSW ski resorts overnight as temperatures dropped to a low of minus 3.8 degrees Celcius at Perisher and minus 3 degrees at Thredbo. Intermittent light snow flurries continued to fall into the morning on Mount Perisher. Weather forecasters are already predicting a bumper snow season for 2008, according to resort management. Temperatures are expected to remain low with persistent precipitation throughout winter. 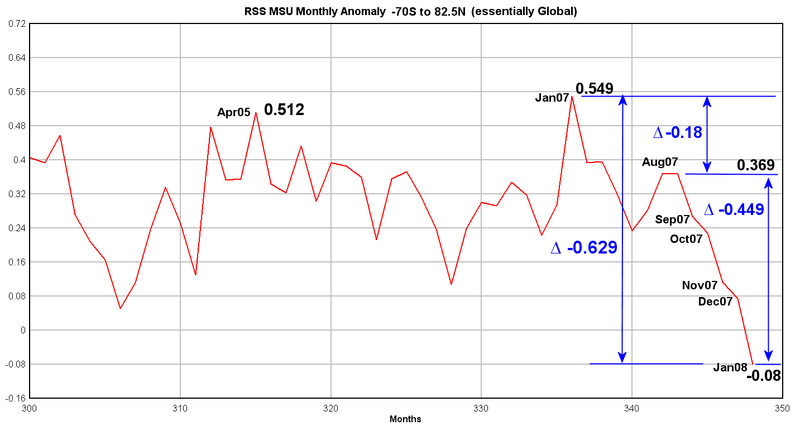 Either Cycle 24 Starts Up, or Earth Cools Down (Bigtime). The solar weather report today is not good; if you like to eat. There is no solar weather, to speak of. If solar cycle 24 does not start soon, Earth could quickly sink into another Ice Age – and actually we are about due for one. Unfortunately, carbon dioxide abatement will have exactly the same impact on the coming and perhaps imminent Ice Age; as human-generated carbon dioxide had on the interglacial warming! Namely: zero, nada, none. (Except that high carbon dioxide levels may slightly enhance failing crops as the Earth freezes). CHICAGO — Contrary to the conventional wisdom of the day, the real danger facing humanity is not global warming, but more likely the coming of a new Ice Age. What we live in now is known as an interglacial, a relatively brief period between long ice ages. Unfortunately for us, most interglacial periods last only about ten thousand years, and that is how long it has been since the last Ice Age ended. How much longer do we have before the ice begins to spread across the Earth’s surface? Less than a hundred years or several hundred? We simply don’t know. Al Gore and colleagues think they know better than the free market economy of the United States, what to do with capital. Their BEST idea was to fight carbon dioxide. Government proves again: capital belongs in the free markets. How much longer will we test, at mortal cost, this fundamental principal of human governance? What funds governments, including the United Nations, has directed to carbon dioxide emission control has been the most foolish of wastes. Al Gore: Give the Nobel Prize Back! Al Gore, a warm Earth is a rich and prosperous Earth, for humans and the species. Al Gore, the Earth is not warming. Anthropogenic carbon dioxide has had no observable impact; except to increase crop yields. Al Gore, a cold Earth is a deadly Earth, to humans and to all species. History is replete with evidence; as is paleoclimatology (which is a science, Al). Al Gore, legitimate scientists should be concerned about global cooling today. You have obstructed funding of all research related to climate, except fraudulent “research” which helped you sell carbon credits. Al Gore, you have willfully prevented research in increasing food production during inevitable cold periods facing humankind. Al Gore, you have obstructed and prevented the honest measurement of temperature in every city, town, and hamlet on Earth. Al Gore, you have lied to all humanity. Al Gore, as humans and countless, innocent, polar bears freeze to death today; as crops fail; as food supplies dwindle; you flip/flop and now maintain that carbon dioxide is a global coolant suddenly, by magic transposed from a greenhouse gas. Al Gore, desist from your bizarre attempts to invert your profoundly stupid hockey stick curve; for the sake of your pocket-book, as you wreak death and devastation upon all humankind. Al Gore, you are obviously a criminal organization. Al Gore – GIVE THE NOBEL PRIZE BACK. You have embarrassed the entire human race; and probably embarrassed the entire universe. polar bear extinction is going to have to be from too much ice; see here. Are the world’s ice caps melting because of climate change, or are the reports just a lot of scare mongering by the advocates of the global warming theory?Scare mongering appears to be the case, according to reports from the U.S. National Oceanic and Atmospheric Administration (NOAA) that reveal that almost all the allegedly “lost” ice has come back. A NOAA report shows that ice levels which had shrunk from 5 million square miles in January 2007 to just 1.5 million square miles in October, are almost back to their original levels. Moreover, a Feb. 18 report in the London Daily Express showed that there is nearly a third more ice in Antarctica than usual, challenging the global warming crusaders and buttressing arguments of skeptics who deny that the world is undergoing global warming. The Daily express recalls the photograph of polar bears clinging on to a melting iceberg which has been widely hailed as proof of the need to fight climate change and has been used by former Vice President Al Gore during his “Inconvenient Truth” lectures about mankind’s alleged impact on the global climate. Gore fails to mention that the photograph was taken in the month of August when melting is normal. Or that the polar bear population has soared in recent years. All caused by carbon dioxide’s incredible greenhouse capacity. 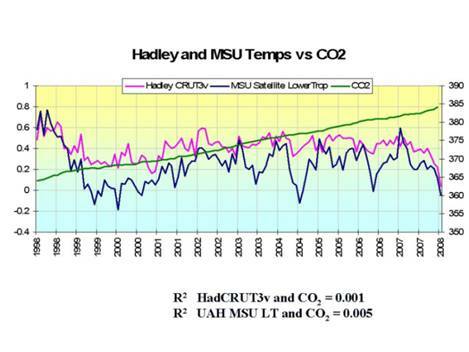 James Hansen, Al Gore, Michael Mann; never fear! You can easily contrive ANOTHER hockey-stick curve, POINTING DOWN. BEIJING (XFN-ASIA) – Icy temperatures have swept through south China, stranding 180,000 people and leading to widespread power cuts, just as the area was recovering from the worst weather in 50 years, the government said. The latest cold snap has taken a severe toll in mountainous but usually temperate Yunnan province, struck by heavy snowfalls since Thursday, a government official from the provincial disaster release office told Agence France-Presse. In Yunnan, 12 people have died, the official Xinhua news agency reported, and four remained missing as of Saturday. In the province’s second largest city, Qujing, 80 pct of the 2 mln residents did not have electricity due to the most recent cold snap and the severe weather that first hit China in early January, the China Daily said. The snowfalls over the past few days have cut off 14,000 kilometres of roads in Yunnan, stranding large numbers of people, the newspaper said, citing provincial transport authorities. In Qujing, six highways have been closed while 42 bus routes have been cancelled, according to the China Daily. ‘As the bad weather continues, the rescue work is becoming much harder,’ said the official from the provincial disaster release office, referring to helping stranded passengers, clearing roads and getting power back up. ‘Among all the cities affected by the snow disaster, Qujing city suffered from the greatest economic losses,’ the official added. Some 180,000 people were stranded in south China due to the latest weather troubles, the government and state media reported. Usually warm and sunny Yunnan was one of the areas hard hit by the frigid weather in January and early February, which pummelled China’s south, southwest and east, in the worst winter weather seen in five decades. The three weeks of severe weather left millions stranded, as the nation’s power and transport networks were unable to cope with the blizzards and sub-zero temperatures. Sun’s magnetic field, and sunspots are gone. Cycle 24 is OVERDUE, and maybe postponed indefinitely! Collectivists say: Stop emitting carbon dioxide now; else you will FREEZE and STARVE! Last week, we were going to BOIL, and STARVE! Which is it, idiots? Make up, whatever it is you call, your minds. As carbon dioxide continues to increase, Earth’s temperature, worldwide plummets.